...Both the seeds as well as the unpurified oil contain a diversity of valuable components, essential for health and beauty. See for yourself how amazing the properties and results of this liquid are. Start your beautifying and nurturing treatment today! 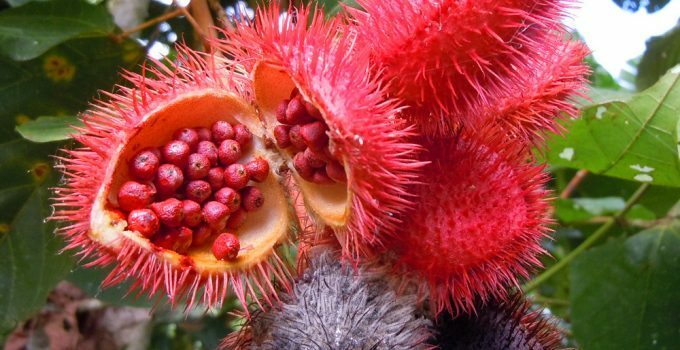 Roucou oil is extracted from Achiote, also called annatto or the lipstick tree. The plant has colourful flowers and seeds, pepper aroma and sweet, nutty and pepper taste. It grown in Central and South America. 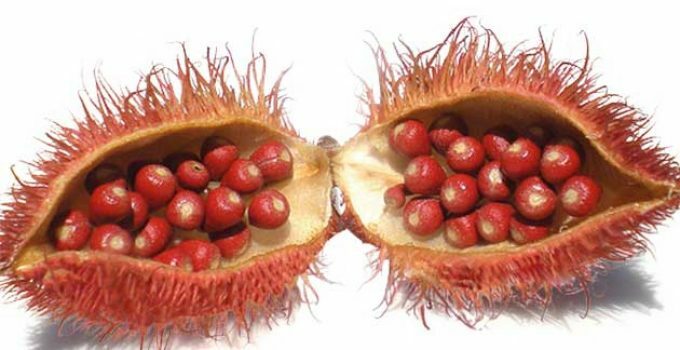 Annatto is often used as a natural dye for fabrics, food and body. This natural colourant is gained by boiling the seeds in water or oil. 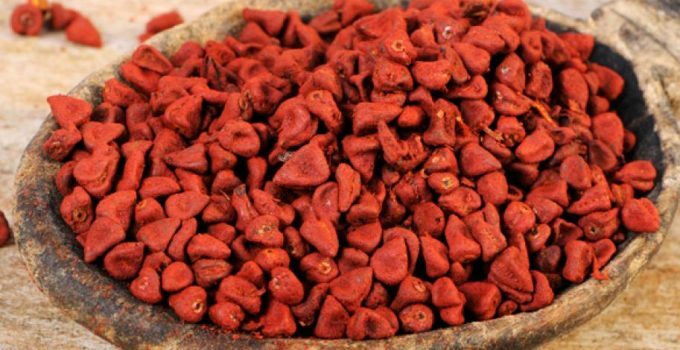 What are other uses of the seeds of Achiote? Roucou oil, responsible for nurturing hair and scalp, derives from this plant. Check out what are its properties and how to use it. Due to the high content of vitamins and minerals contained in roucou oil, it is willingly used in hair and body care. We will find beta-carotene, vitamins A and D in it. Beta-carotene evens out the colour of the skin, stimulates the production of collagen and protects complexion from harmful effects of sun radiation. What is more, roucou oil has antiseptic and soothing properties. It can be added to shampoo, hair mask, conditioner and all other kinds of cosmetics. What will be the results of such actions? The product has antioxidant properties, which means that it reduces free radicals, protects scalp from harmful external factors and delays ageing processes. Moreover, the cosmetic stimulates the production of melanin, thanks to which the colour of your hair will remain beautiful and vivid. Roucou oil protects hair and scalp from harmful sun radiation, air pollution, some cosmetic ingredients and other factors. It regenerates hair structure, rebulids split ends, smooths, softens and moisturises. The cosmetic has antibacterial effects and soothes scalp. It also prevents frizz and static, does not weigh wisps down, facilitates styling and combing. How to use roucou oil? It is very simple. Apply the cosmetic to dry or wet hair, either exclusively on scalp or on entire hair. Remember that roucou oil must be thoroughly rubbed at your hair and left for a few hours. However, the best results will be achieved after leaving it in overnight. Remember to put on a shower cap and a warmed up towel to improve the effects. Why? Warm environment is created under the plastic cap, this will raise scales and consequently, allow nutrients to penetrate deeply into hair structures. Wash it off with a gentle shampoo after a few hours (or in the morning). Style your wisps as usually. 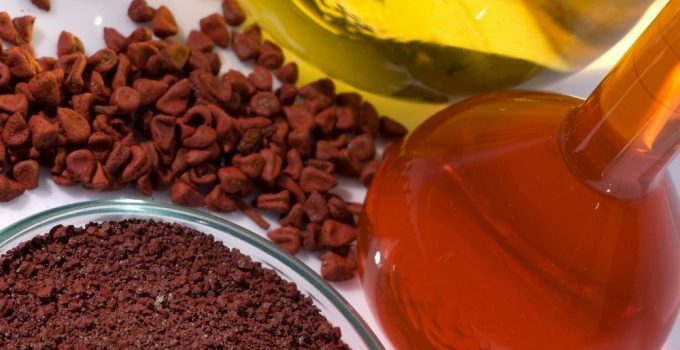 How to prepare your own roucou oil, in the comfort of your own home? It is very simple. Prepare annatto seeds and a saucepan with water. Begin with boiling your water. Next, pour three tablespoons of seeds. Stir until they start giving colour; water should become red or dark orange. Wait a while for the blend to cool down. Then, apply it on hair and scalp. Do not forget about scalp massage. Leave it in for about an hour. After this time, wash your hair and dry it (preferably leave it to air-dry). Style as usually.